Whether you’ve been promoted to management recently or have been at it for ten years or longer, one thing never changes: Human nature — as in that of your employees — is often unpredictable. Knowing how to motivate each person on a team can be so frustrating and challenging. But it can be done if managers have a basic understanding of human behavior — what makes people tick. What science has already found is that positive emotions (how work and culture make employees feel) are at the root of human motivation. We are wired for it in our creation design. Therefore, managers must acquire the knowledge of what truly inspires loyal human beings to enthusiastically perform at a high level. Let me prescribe eight strategies to help managers create the right atmosphere for motivating others. 1. Start with scheduling more one on one time. Get off on the right track by making consistent clear goals and expectations an operational reality. You do that through the lost art of one-on-one conversations — a great motivational tool. Leaders thrive when they strengthen relationships with their people by spending more one-on-one time with them to hear their suggestions, ideas, problems and issues as well as talking about performance issues and their work. But first, you need to know how to structure these meetings so that it works to your advantage. 2. Find out what motivates them. Do you know what gets your team members out of bed in the morning? What they’re passionate about — their goals, aspirations, and interests? In other words, do you really know your team members? Great leaders show an interest in their people’s jobs and career aspirations in order to motivate them the right way. Once that’s been established, they look into the future to create learning and development opportunities for their people. They find out what motivates their best people by getting to know what desires will drive each team member. This is about emotional engagement. 3. Provide the resources they need to do their work exceptionally well. It’s a simple question, but you’d be surprised how often it is not asked: What do you need right now to do your job better? You may be surprised, or even shocked at the answer; it could be that they need access to more information to make the right decisions, bettter equipment or even another work space. Acting on what you find out will be a huge motivational booster. 4. Praise and compliment them often. 5. Help co-create purposeful work. People want meaning and purpose in their work. In the book Give and Take, Wharton professor Adam Grant says that when people find purpose in their work, it not only improves that person’s happiness, it also boosts productivity. One way to give employees that purpose, according to Grant, is to have them meet the very people they are helping and serving, even if just for a few minutes. Managers giving their people access to customers so they can see firsthand the human impact their work makes is the greatest human motivator, says Grant. 6. Help them develop new skills. Although important, I’m not so much talking about putting them through another required technical or safety training program to keep them or the business compliant, but actually giving them meaningful new skills or knowledge in other areas that they can use to leverage their natural strengths for future roles, whether with their current company or another company. The point is to serve and value them so exceptionally well as people and workers that they have no reason to leave but use their newfound skills for new projects. Great managers recognize that leadership doesn’t travel one way but is multi-directional. While it can come from the top down at critical times, the best scenario is allowing decisions, information, and delegation to travel from peer to peer or from the bottom up, where the collective wisdom and involvement of the whole team help solve real issues in real time on the frontlines. Do you trust your knowledge workers to do what they’ve been hired to do? Do they have the right competence for the job to carry out the work with confidence? So often managers underestimate the potential and ability of their employees to use their brains! If you answered yes to the questions above, be of the mindset to always accept that they can do the work. Then, give them the room to perform and support them with whatever they need to make them even better. This is how you motivate them to the rafters. The AI debate/phenomenon rages on. The McKinsey Global Institute just issued a report that signals a massive pending workforce transition on the same scale as the shift from agricultural to industrial jobs in the 1900’s. Depending on the rate at which advanced and developing countries around the world embrace the surging reality of automation, McKinsey’s midpoint estimate was between 400 million and 800 million jobs could be lost to automation, with 75 million to 375 million among the displaced needing to switch occupational categories and learn new skills. Up to one-third of the workers in the United States and Germany and an astonishing 46 percent of workers in Japan may have to change occupations by 2030 according to the report. First, the good news within all of this. Automation is coming like a steamroller–even conservative estimates spell a seismic shift in occupational realities. And the key to stopping massive unemployment and wage deflation is to retrain the global workforce–something there are few precedents for on this scale. Let’s look at the winners and losers in occupations and then we’ll come back to that retraining thorn. (By the way, most of us, regardless of occupation, aren’t off the hook as the report indicated that 60 percent of occupations have at least 30 percent of their work activities highly subject to being replaced by automation). Predictable Physical Laborers -31percent (repair workers, dishwashers, food prep workers, gaming industry workers, general mechanics). This shouldn’t come as a surprise. For example, Walmart is already testing robots that clean and scrub floors in five of their stores. The report indicates that automation will expand the labor market as long as displaced workers find work within a year. The key to that is the rate of innovation companies can muster and the quality of retraining offered. What will the workforce need to be retrained on to ensure rapid redeployment? Things machines can’t do silly. Like managing people, applying expertise, and communicating with others. The workforce will also need to build social and emotional skills and more advanced thinking capabilities like logical reasoning and creativity. So it can be done. However, the report goes on to say that over the last few decades, public and corporate spending on labor force training has rapidly declined–a trend that must reverse with governments and corporations making workforce transitions and job creation a more urgent priority. Net–a dramatic shift is coming. But will the Rise of the Robots mean we rise, or fall? It’s in our (very human) hands now. It’s easy to see how blockchain technology could destroy bank profits. After all, it allows people and businesses to conduct business peer-to-peer, thereby cutting out the middleman. 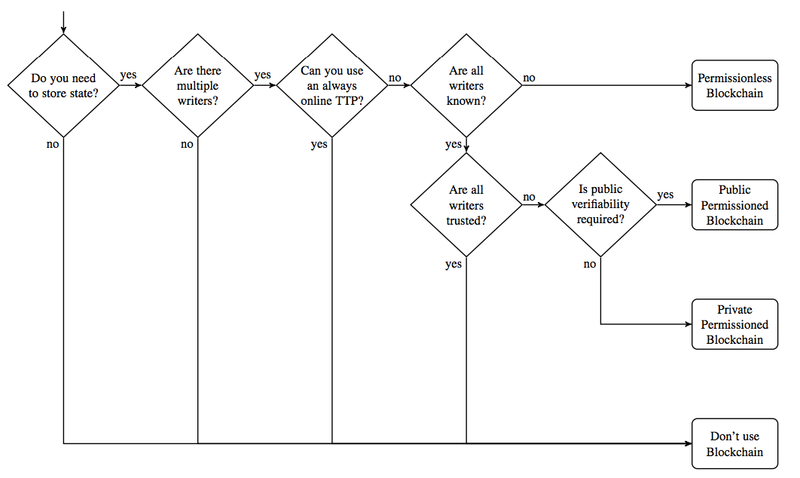 Imagine what happens when financial transactions happen without a 3rd party intermediary, such as Wells Fargo (WFC). As a shareholder, the first reaction to blockchain might be horror because banks depend on being the source of truth and trust between parties. That’s how they seemingly add value, in effect, by selling trust via accountability, tracking, auditing and so on. To emphasize, the key element is that no central authority, no bank, no Wells Fargo is in the middle or anywhere in this chain of events. If you’re an investor and you’re not at least a little bit curious, or downright worried, then it’s time to look at this because it’s happening right now. Banks might feel threatened. With blockchain, we can imagine a world in which contracts are embedded in digital code and stored in transparent, shared databases, where they are protected from deletion, tampering, and revision. In this world every agreement, every process, every task, and every payment would have a digital record and signature that could be identified, validated, stored, and shared. Intermediaries like lawyers, brokers, and bankers might no longer be necessary. Individuals, organizations, machines, and algorithms would freely transact and interact with one another with little friction. Despite the potential for fear as a Wells Fargo investor, I tend to look at blockchain as an opportunity more than a threat. Let’s look at what WFC has been doing to ensure their survival, and perhaps even grow their competitive advantage. Before we do that, remember that blockchain isn’t right for everything. We need to ask the question: Do you even need blockchain? It’s not a one size fits all technology, and it’s still new. And, perhaps WFC can exploit blockchain? We’ll return to this idea shortly. The essential point is that blockchain might be pretty much useless in many situations, and may not pose any threat whatever in some areas of banking. Furthermore, blockchain can provide cost reductions, time reductions, and increase competitive advantages for banks in some ways. Blockchain can therefore improve profits for banks when properly installed, in the right places. …a vast messaging network used by banks and other financial institutions to quickly, accurately, and securely send and receive information such as money transfer instructions. Every day, nearly 10,000 SWIFT member institutions send approximately 24 million messages on the network. International wire transfers between banks cost from $5 to more than $50, plus foreign-exchange charges of 0.25% to 3% and “landing fees” of as much as $20. And the error rate for wire transfers is between 3% and 5%, Thomas said. Where Swift, the Society for Worldwide Interbank Financial Telecommunication, provides a one-way messaging service, Ripple provides a two-way protocol. This allows for greater transparency: Banks can exchange information and find out ahead of time what the fees and foreign-exchange rates will be, along with the expected date of delivery for the funds. If any of the information is wrong or missing, both banks will find out before the payment is sent, which should keep transfers from getting stuck in the pipes. The Commonwealth Bank of Australia, Wells Fargo, and Brighann Cotton have claimed the first interbank trade transaction combining blockchain technology, smart contracts, and the Internet of Things (IoT). The transaction, which took place between Brighann Cotton US and Brighann Cotton Marketing Australia, and their respective banks Wells Fargo and Commonwealth Bank, involved a shipment of 88 bales of cotton from Texas, USA to Qingdao, China. The message here is that Wells Fargo isn’t sitting and waiting for blockchain to steamroll their business. Instead they are using blockchain, including various experiments with Ripple, to innovate and improve. Most of this will happen behind the scenes and out of sight of average customers. And, most of the initial advantages will come from bank-to-bank or institutional transactions behind the scenes. In other words we’re not talking about better usability or new customer tools but instead this is about accuracy, efficiencies, and other operations related advantages. Put another way, the real disruption with blockchain and banking is to the tools and services that support the industry, such as SWIFT. Indeed, Wells Fargo can exploit blockchain technology while simultaneously pressuring providers to use it to drive down costs. This is something like how Wal-Mart (WMT) puts pressure on suppliers to drive down costs, and improve logistics efficiencies. Technologies like barcodes, RFID and IoT can cause some disruption but mostly they are enablers. By analogy, blockchain isn’t so much of a threat as it is an unknown. You still need businesses and banks like Wells Fargo to provide software, tools, services, interfaces and more. You also will probably need banks to handle contracts and various negotiations for many, many years. There’s far less of a replacement threat than there is a pace-of-adoption threat. If other banks, such as Bank of America (BAC) or JPMorgan (JPM) adopt blockchain faster and better, that’s the problem, not blockchain inherently. I also want to bring up another idea about adoption. Stick with me on this. When people talk about artificial intelligence, they tend to think about computer and robots, and how they will take over or replace humans. This is extremely black and white, us vs. them thinking. It’s far more likely that in the short and medium term, computer technology will augment our bodies and our thinking. Still with me? Well, consider the same type of transformation happening with blockchain and Wells Fargo. Blockchain isn’t going to suddenly overthrow banking. Bitcoin can’t instantly replace Wells Fargo. Instead, we’re seeing how banks cautiously experiment and slowly embrace blockchain. There won’t be a revolution but instead there will be an evolution. Blockchain will augment banking, not replace it. 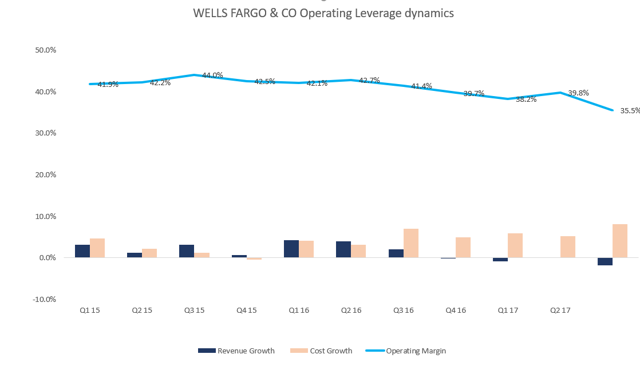 Wells Fargo might experience some bumps along the way but ultimately what was meant to replace banking will instead augment it. Investors are safe as long as bank leadership incorporates blockchain intelligently. On the surface, blockchain threatens banks like Wells Fargo because people and businesses can carry out transactions peer-to-peer. This is far more imaginary and ideal than true. This is the dream, the ideal, but not the raw truth in the market. Blockchain isn’t relevant or necessary in many banking situations. Banks are unlikely to embrace blockchain in many situations simply because it isn’t as efficient or effective, and will likely never be the right fit for many types of transactions. In cases where person-to-person or business-to-business transactions are a good fit for blockchain, it’s quite possible that banks will provide other tools and services to facilitate the activity (e.g., software or mobile apps). The threat isn’t blockchain, it’s that banks like Wells Fargo don’t adapt. This is a business threat, not a technology threat. There are plenty of situations where blockchain is a strong enabling technology, such that banks can increase speed and efficiency, while driving down costs. Wells Fargo, for example, could also drive 3rd parties to use blockchain technology to better trace and track transactions. This again is not at all a technology threat but more of a business re-engineering opportunity in their ecosystem. Taken as a whole, as long as Wells Fargo continues to move forward with blockchain adoption, they aren’t threatened. The biggest threat isn’t the technology itself but instead lack of adoption if competitors move faster, with better solutions, and internal efficiencies. Blockchain won’t eat Wells Fargo. I certainly wouldn’t short WFC because of any type of existential threat fueled by blockchain or the Bitcoin phenomenon. It’s way more of a “wait and see” situation. I can’t see blockchain directly destroying Wells Fargo, but I do see how it could cause pain if they don’t adapt and adopt. Giddy up! Disclosure: I am/we are long WFC,WMT,BAC. MUMBAI/NEW DELHI (Reuters) – India’s telecom regulator has made recommendations to ensure an open internet in the country and prevent any discrimination in internet access in a long-awaited report, after debating the issue of net neutrality for more than a year. The Telecom Regulatory Authority of India (TRAI) said it was not in favor of any “discriminatory treatment” with data, including blocking, slowing or offering preferential speeds or treatment to any content. The Indian regulator’s support of net neutrality stands in contrast to the recent stance taken by the chair of the U.S. Federal Communications Commission. Last week, Ajit Pai, a Republican appointed by President Donald Trump in January, unveiled plans to rescind so-called net neutrality rules championed by former President Barack Obama that treated internet service providers like public utilities. In India, TRAI ruled in favor of net neutrality in February 2016 by prohibiting discriminatory tariffs for data, after an extended campaign by internet activists who argued that offerings such as Facebook’s (FB.O) free basics platform violated net neutrality principles. The new regulations go a step further and recommend prohibiting any service provider from throttling data speeds. “The core principles of net neutrality, non-discriminatory treatment of all content, treating internet as an open platform, we’ve upheld them,” TRAI Chairman RS Sharma said. Idea Cellular Ltd (IDEA.NS), India’s third-biggest wireless carrier, said it was not currently planning to comment on the recommendations, while Vodafone Group (VOD.L) said it would respond after studying the suggestions. Activists said while the recommendations were welcome, they needed to be put into license agreements. “Our job is not done,” said Apar Gupta, a Supreme Court lawyer and co-founder of the Internet Freedom Foundation. “It falls on the Department of Telecommunications to take the recommendations and turn them into licensing conditions to be put on telecom providers,” Gupta said, adding there was no timeframe regarding the implementation of the recommendations. TRAI’s recommendations are the latest in India’s efforts to define net neutrality. In 2016, TRAI issued a pre-consultation paper on the hotly debated issue and followed it up with a consultation paper in January 2017. TRAI’s Sharma warned against “providing open access to the internet in the name of specialized service”. “It should not happen that some entity offers specialized services and it basically deteriorates the normal internet service that company provides. That should not happen,” Sharma said on a television show on Tuesday. We’re going to write a lot about Bitcoin over the next few months, as it’s pretty topical. Just this weekend, in fact, China got mad with the cryptocurrency and is now working to shut down many of the exchanges it trades on in China. After this news came out, the price of a Bitcoin promptly fell 7%. So many questions, so little time. OK, so what is Bitcoin? There are so many different ways we have thought about attacking this question, but none of them are appropriate for a single 5-minute session. So instead, we are going to do this over multiple notes. By the end, you will know exactly what a Bitcoin is, why China is closing exchanges which allow you to trade bitcoins, and why them doing so has caused the price of a Bitcoin to fall. First and foremost, it is really important you realise that Bitcoin is a completely made up currency that only exists on computers and the internet. And technically, it’s not even a currency at all. It’s an invention. It’s a piece of technology. And it’s the technology part which is super interesting. The Bitcoin itself, not so much. But today we’re not going to discuss any of that. Today, we just want you to know what a currency is, and why it has value. Have you played the game “if you were stuck on a desert island, and could only take ten things with you, what would you take”? Classic game. Good times. How many of you ever answered “cash” as one of your things? None right. Ever wondered why? It’s because money or cash actually has no inherent or intrinsic value. Zero. You can’t eat it, drink it, smoke it, sleep with it, wear it or live in it. It would be of literally no use to you on a deserted island. Cash only has value because people believe that everyone else believes it has value. Sounds dumb, but it’s true. And because everyone else believes it has value, they are happy to receive it in exchange for providing goods and services. The real question then is, why does everyone else believe it has value? Well that’s because it’s the only way you can pay your taxes to the government. That is why currency has value. In fact, that is the only reason currency has value. If the government suddenly announced it would only accept bananas as payment for taxes going forward, bananas would become the accepted form of exchange (and store) of value. It would be how you paid for your Uber, your toothbrush and your energy bill. That’s not a joke. That is exactly what would happen. Back in the old days, when people rode dragons, rather than use currency, they would exchange goods and services for gold. Literally. The price of a good or service would be in terms of a weight of gold. The problem with that though was gold was hard to transport and more so difficult to break down into small, agreed sizes. This made it problematic to exchange. To solve this problem, over time, rather than exchange pieces of gold, people would exchange pieces of paper, which represented claims on gold. And you could trade these claims with the government, which would give you gold for your currency. Therefore, currency had value because it represented a claim on gold. Today currency has value because it is backed by the full faith of the government. At this point, you should be asking yourself, how then does Bitcoin have any value. Previously we said it’s the technology behind Bitcoin that you should be excited about, rather than with Bitcoin itself. So now, let’s go deep on the tech side of things. Quick caveat though. We are not tech-heads. In fact, we are far from it. Knowing that we should turn it off and on again is about the extent of our computer wizardry. There are three key ingredients to Bitcoin’s structure. There’s the Blockchain, the Distributed Ledger and the Cryptography. We’ll discuss each one, but if you really want to get into the detail, we’d highly, highly recommend watching this video. Now because you know both Matt and Damon’s starting balances and because the blockchain has every transaction which ever occurred, you can very easily work out their current balance. In the case above, Matt starts with 50, pays 50 and then receives 25. Meaning his current balance is 25. It’s called blockchain because rather than adding transactions one by one, they get added in blocks, like links on a chain. Or blocks on a chain even. Hence the name “blockchain”. And that’s really it. What gives blockchain its power though, is when it’s combined with a distributed ledger and cryptography. Distributed ledger: So, a blockchain is just a ledger showing all historical transactions in the system. Importantly there isn’t just one copy of this ledger. There are thousands of them. And they are kept on of different people’s computers (called “miners”) all over the world. When a new block of transactions occurs, all these miners/computers update each of their ledgers simultaneously. Importantly, anyone with a powerful enough computer can keep and maintain the ledger. Therefore, in geek-speak, the Blockchain is kept on a distributed ledger, distributed across many different computers. The libertarians of the world love this by the way, as it means control of the ledger/blockchain is decentralized. It’s distributed “among the people” rather than owned by a single corporation of the government. Cryptography: You know how your dollar-dollar-bills-yo have watermarks on them? This is to make it really hard for people to create counterfeit copies of them. To verify the notes are legitimate, people will put them into the light and check the watermark is as they expect. In a really rudimentary way, they are “decoding” the watermark with their eyes to verify it’s valid. Watermarks are really difficult to make (meaning they are hard to forge), but their validity is really easy to verify. Cryptography is the computer-world version of the watermark. And when a new block of transactions gets added to the blockchain, a computerised watermark using cryptography is added to that block as well. This watermark uses a lot of mathematics and is extremely computer power intensive to generate. This is intentional, to make it extremely difficult to create and hence forge a block of transactions, just like with the watermark example above. Once one of the computers within the distributed ledger generates the watermark, all other computers are able to verify whether it’s correct or not really simply by doing the computer equivalent of putting a note up against the light. Therefore, the cryptography used means the watermark is extremely difficult to generate, but super simple to verify. Once verified, the new block of transactions gets added to the front of the blockchain on every single computer making up the distributed ledger. So blockchain is just the term for the history of all transactions. These transactions are kept and maintained by heaps of computers all over the world (the distributed ledger). 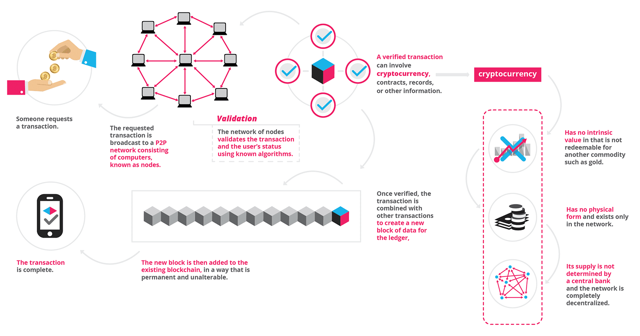 When new transactions occur, rather than being added one-by-one, they get added to the system in blocks. And each new block is assigned a unique watermark which is impossible to forge. In summary, blockchain technology enables a historical, unalterable record, which is kept on thousands of people’s computers, of every single transaction that ever occurred in the system. It provides a full audit trail of everything, ever. And it can never, ever be changed. Therefore, the system has complete trust and forgery is near impossible. OK, so I get what bitcoin is now, but I still don’t understand why people are using it instead of actual money. The technology seems smart, but it’s still not a real currency, right? It’s a great question and we’ll try and answer it in this part. People interested in Bitcoin fall into one of four main groups: Libertarians, the Chinese, criminals, and those believing Bitcoin will lead to lower payment processing fees. There are also the speculators, but we won’t really discuss them here. 1: The Libertarians: Libertarians LOVE Bitcoin. They are anti-government and anti-centralised power, and Bitcoin ticks those boxes. Whereas Australian dollars are owned and controlled by Australia’s central bank (the RBA), Bitcoin is owned by the people sitting outside the government’s control. It is the underlying philosophy of the blockchain which draws libertarians to bitcoins as well as the other cryptocurrencies. 2. Lower payment processing fees: Merchants who accept Visa or Mastercard pay them a processing fee to VERIFY and AUTHENTICATE each of their transactions. A lot of times, you as the consumer will see this cost passed on to you via an additional “credit card surcharge”. This isn’t small either, usually between 1 and 3%. Fees for transactions with Bitcoin, however, are significantly lower. As we discussed earlier, transactions get added to the blockchain in blocks after a “watermark” has been added to verify the blocks’ authenticity. This process is actually analogous to what Visa, Mastercard, PayPal and other payment processors do when they verify and authenticate transactions. However, processing a block of transactions with Bitcoin is a lot cheaper. Rather than paying 1-3% per transaction, Bitcoin transactions can cost less than 0.1%. That’s a big saving to the consumer and the merchant. And it is one of the reasons we believe the technology behind Bitcoin is so powerful. Bitcoin, however, not so much. 3. Criminals: Remember when you set-up your savings account with the bank? And how you had to provide your driving license, utility bill, passport and Medicare card? All of that was to prove you are who you say you are. Well, Bitcoin doesn’t require any of that. Setting up a Bitcoin account in some instances can be as simple as just providing an email address. Yep, an email address gets you a Bitcoin account and then you’re good to start moving money around as you see fit. In this sense, Bitcoin provides you with anonymity – or for the pedants among you, pseudonymity. You have a unique identifier for your Bitcoin account (your pseudonym) and every transaction you’re involved with will include that. However, there is no link between you and your pseudonym. So you’re not quite anonymous, but pretty close to it. Here’s the best example we can give that Bitcoin is the currency of crime. There was a website called Silk Road, which was recently shutdown. On it, you were able to buy all things illegal. Yep, you could get anything from Mary-Jane (that’s marijuana Mum) to heroin, cocaine, counterfeit watches and even hitmen (and women). How did people pay for this? They used Bitcoin. In fact, that was the only currency accepted. And why Bitcoin? Because of the anonymity protection provided by it. And when you’re dealing in crime, anonymity is key. Do you remember the WannaCry attack? Essentially it was a computer virus which locked entire organisations (including FedEx, Nissan and the UK National Health Service) out of their computers. The only way to regain access to them was to pay the hackers a fee. And how did they accept their fee? Via Bitcoin of course. 4. The Chinese: Relax. We are not being Ray-Ray. It’s the truth. While we don’t have enough time to get into capital controls here, in short, China has put in place a number of restrictions, which prevents people from taking large amounts of Yuan (the Chinese currency) out of the country. People are always looking for ways to get around this, and Bitcoin provides the perfect vehicle to do so. And that’s what’s happening. The Chinese exchange their Yuan for Bitcoin. They then exchange their Bitcoin for another currency, say USD. Boom. They have now moved their money out of China. Well, that was easy. Estimates put the percentage of trading in Bitcoin which occurs in China upwards of 70%. No one knows anything for certain in finance. Investing is gambling. Educated gambling, but it’s gambling nonetheless. Never, ever listen to anyone who tells you that something is definitely going up, or definitely going down, as they cannot know it with 100% certainty. A key motivator of us writing this, is that the Finance industry is filled with so many pariahs who prey on the ill-informed and make money for no one but themselves. The purpose of The Daily is to shed some light on all things financial, to help you understand better what is going on, and to make better decisions yourself. We are not telling you what to or not to invest in, but we will tell you our opinions. And they could very easily be wrong. On Bitcoin. We think the technology behind it is incredible. Game changing in fact. If you’re interested in how it can be applied in really clever ways, read this article by The Huffington Post. 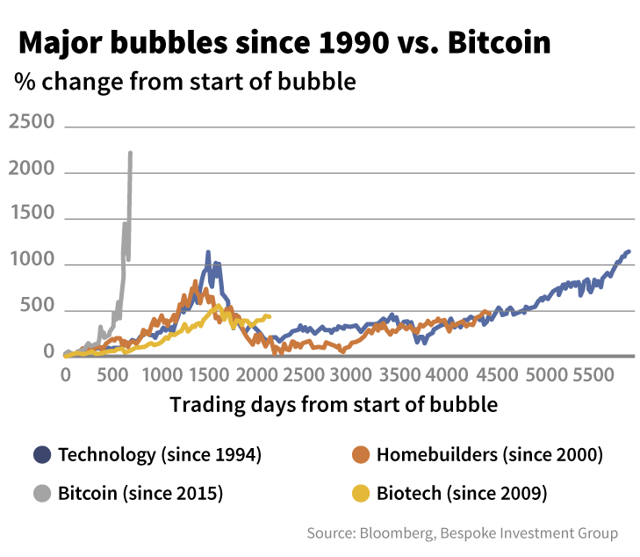 Bitcoin however, and all of the other copycat cryptocurrencies which have crept up over the last year, will most likely fall by the wayside. And in the next part, we’ll tell you why we think so. For now, here’s an article which quotes Jamie Dimon who heads up the largest bank in the United States. There are three sections below. “The Summary is This” which is our traditional 5 minute yarn. After which we’ve also included “A Little Bit More” which has lot more detail if you want it. We wrote it, so we think it’s worth reading, but you do so at your own risk. Finally, there’s “Here’s a Story” at the end. The technology behind Bitcoin is so unbelievably clever it’s not funny. Over the next 5-10 years, you should expect a whole ecosystem of technologies to spawn, which are based on the blockchain concept. Further, we fully expect that governments over time will turn our currency into a digital one. We are already moving towards a cashless society, so putting our currency into the blockchain is a very logical next step. In fact, like one our readers pointed out, they have already hinted at it. So the blockchain rocks. Woot Woot. Bitcoin does not. It’s getting a lot of airplay at the moment, because of the technology behind it and so it should. However, Bitcoin has no intrinsic value. And that is a super important thing that you must understand. Bitcoins cannot be eaten, drunk, worn, slept with or lived in. And the government will not accept them as a form of payment either. It only has value because a certain group of other people believe it has value, and we’ve discussed them previously: Libertarians, criminals, people who want lower processing fees, the Chinese who are trying to get money out of the country, and speculators. However. China is closing down Bitcoin exchanges. Governments are getting better at tracking criminals who use bitcoins to launder money. The value of a Bitcoin fluctuates a lot and often which makes it difficult for businesses to accept it as a form of payment. There’s also the fact that the government needs to control the value of our currency so as to manage the economy, which may mean they will crack down on Bitcoin should it get too much use (just like what China is doing right now). When you combine all of that with the fact that Bitcoin has no intrinsic value whatsoever, you should at least start to question whether buying Bitcoins is really such a smart idea. Having said all of that, in the short term, Bitcoin may very well go up. And if you like to gamble, throw some money in. But only a little bit and only what you can genuinely afford to lose. Because what you’ll be doing is speculating, not investing. For you to make money buying Bitcoin, you have to rely on the hope that other people are going to want to buy it after you and at a higher price than you paid. And maybe they will. Just like the Dutch did with tulips in 1600’s. In the long run, we strongly believe that Bitcoin will fall to the wayside as governments themselves transform their own currencies into cryptographic ones. Will we be right? Only time will tell. And that’s 5 minutes. Hope it helped. Imagine you’re a business owner. And your business is selling cars. You have expenses, like wages, rent, tax and the purchasing of cars in the first place, all of which must be paid in Australian dollars. That’s not a problem, as all of your income from selling cars is in Australian dollars as well. In financial speak, we’d say you have no currency risk. It doesn’t matter whether the Australian dollar goes up or down, your income and expenses will remain unchanged. Sweet as bro. Enter Bitcoin. The cost of a single Bitcoin frequently fluctuates in meaningful ways. During a week in August Bitcoin surged 20%. In July it jumped 15% in a single day. On Monday, it fell 8%. June last year it fell 25% in a week. Anyway, back to your car business. Knowing that the value of a Bitcoin is inherently unstable, would you be willing to receive Bitcoin as payment for your vehicles? That’s a lot of “currency risk” you’d be taking on. The optimist in you would think, ‘what if it goes up, I could make a fortune’, which is fair. But what if it falls? You’ve bought the car for 20,000 Australian dollars and then sold it for 5 bitcoins, which at the time were worth 5,000 Australian dollars each. So you receive 5 bitcoins which are worth 25,000, therefore you’ve booked in a profit of 5,000. Or have you? You still have to sell those bitcoins so you can pay for all your other expenses which are paid in Australian dollars. What happens if the value of a Bitcoin falls 10% before you do? Your 5 Bitcoins are now worth 22,500 and your profit has halved. That sounds pretty risky to me. And aside from not understanding what a Bitcoin is, this is one of the fundamental reasons the majority of businesses do not accept Bitcoin. Conceptually, businesses should love it. They really should. Like we’ve said previously, transacting in bitcoins substantially reduces transaction fees, which is great. But Bitcoin moves around way too much for any rationale business to start accepting it. Should the government turn your currency into a blockchain currency though, this issue would be eliminated. The currency risk element would disappear and business adoption would be massive given the significant reduction in transaction fees. Long term, this will be bad news for companies like PayPal, Visa, Mastercard and American Express whose entire business model relies on collection these transaction fees. Criminals LOVE bitcoin. Like we said previously, it is the perfect currency for crime. You trade under a pseudonym and setting up an account requires almost no identification. This makes it very hard for the authorities to find you. But not impossible. Remember, Bitcoin is not currency, it is a piece of technology. And that technology is essentially a historical ledger of every transaction which has ever occurred, in the order that it occurred. And that ledger is on thousands of computers all over the world and it is publicly available. Tech-heads are starting to work out how to harness that fact to glean more information off transactions and ultimately work out who is behind them. Don’t ask us how, but they can. At the same time though, the criminals are working on better ways to keep themselves anonymous. And they are still ahead of the authorities, but for how long, who knows. The point being, Bitcoin is still great for funding criminal enterprises. However, it’s not as good as it used to be and it’s only going to get harder. Jason and Bourne (yes, it can be a first name) both run highly successful cafes. And each loves to visit the others. Jason can’t go past Bourne’s famed avo-smash and Bourne is all over Jason’s Mocha-Choco-Lata-yaya. So much so, they are literally in each other’s places daily. One day Jason says to Bourne, ‘mate, money keeps going back and forth between us, why don’t we each just put 100 bucks into a shared account, and rather than me paying you and then you paying me every day, we’ll just track who owns what in a spreadsheet’. Bourne thinks about it for money, and says ‘dude, great idea. But you set it up. ‘Sweet as bro’ replied Jason, ‘we’ll start it from tomorrow’. And so they did. Each put in 100 dollars and each was given 100 ‘units’ in return. Every day Jason would go home and update his spreadsheet with entries like “Jason owes Bourne 15” and “Bourne owes Jason 11.5” and then send the spreadsheet back to Bourne to confirm. This went on for some time, until their friend Matt the mixologist caught wind and wanted in. Matt said ‘my brosephs, I want in’. ‘Why?’ asked Jason. ‘For the same reason man. You guys are drinking at my bar every day, and I’m eating at yours just as often. It just makes it easier for all of us and means we don’t have to keep transferring cash’. Matt’s point was a sold one and so Jason and Bourne brought him in. Matt paid 100 into the kitty and was promptly given 100 units. And over the following months more and more people got involved with the spreadsheet and by the end of the year there was nearly 100 in the system. Each having paid 100 dollars for a 100 units. The spreadsheets were sent around daily to everyone for all to confirm they looked good. Things were working great. Sadly though over this time, Matt’s business had fallen. Distraught, he needed a break and decided to close down his bar. So for him the spreadsheet was of little use anymore. He decided he would cash out. But no one within the system would buy his units from him. This was a problem. The only way Matt could get money out of the system was when a new person asked to join. So Matt went looking. Actively. And successfully. Going forward, rather than issue new units to people, everyone using the spreadsheet agreed that for someone new to enter, they would have to buy existing units from someone else in the system. At first things started slowly. 1 unit cost 2 dollars (rather than 1 when the spreadsheet was first created). But now the existing holders of units realised they could make money by selling their units for a higher price, they started to market their spreadsheet hard. “The spreadsheet is the greatest thing every made“. “It is revolutionary they would say“. “It makes you run higher and jump faster“. “Spreadsheets are the new superfood”. They took out full page adverts in their local paper and radio ads during the ‘love hour’ evangelising the spreadsheet and the units themselves. And the marketing worked. People wanted in. And the more people wanted in, the higher the price would go. First to 3 dollars, then 10, then 100! At 100 dollars, one of the national newspapers took notice and wrote an article about a new potential investment opportunity, one which has already gone up by a factor of 100 in just 6 months. A factor of 100?! In 6 months? Now the speculators got interested. If it can go up 10 times in just six months, imagine what could happen in a year. And so the money flowed in. 200 dollars a unit, 500 dollars a unit. 1000 dollars a unit! Everyone was making money. So copycat spreadsheets started popping up all over the place. The best thing since sliced bread they would say. Meanwhile, Jason, Bourne and Matt were long gone. They have closed down their shops, sold all their units, bought boats and now just giggle at the price rise. 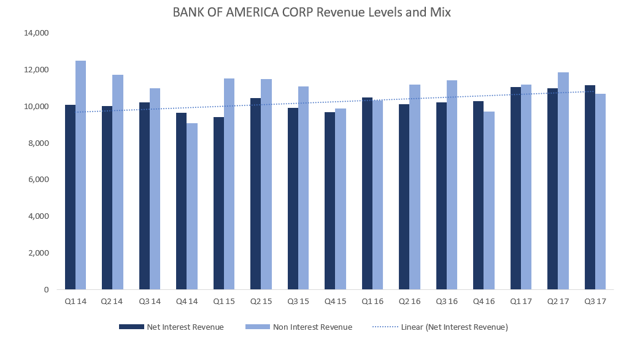 Bank Of America And Wells Fargo: Leading Buffett's Banks In 2018? Warren Buffett’s six best known bank positions have collectively outperformed the KRE regional banks index YTD in terms of total return, chiefly thanks to strong performance in Bank of America (BAC) and Bank of New York Mellon (BK). An equally weighted holding of each of Buffett’s names would have returned an investor 5% YTD, vs 0.6% for the KRE. This isn’t a dramatic difference, you might point out. But that’s how Buffett does it. What can we learn from looking at his banks? Whether you look at the median or the mean, Buffett likes his value. His banks are about 7% cheaper than the the top 20 banks excluding the ones owned by Berkshire. 2018 prospective growth is a bit lower, as it yield of the Buffett group. All data in the valuation tables below uses Bloomberg consensus figures. The value discount of the Buffett sample goes into double digits if you take out M&T Bank. But across the pack, Buffett’s getting very similar growth and yield to the opportunity set, and paying markedly less for it in terms of the multiple of earnings he holds these stocks at. Which banks will win for Buffett in 2018? Buffett won’t be thinking about this question but we mere mortals are allowed a little fun. If there were to be an economic downturn, then I think that USBancorp (USB) and M&T Bank (MTB) would prove defensive and this portfolio would still outperform (especially if held on a straight average basis rather than weighted to market cap). However, there is no reason to expect an economic downturn. The one area of the world economy seeing some marginal weakness is China, and the direct impact of Chinese GDP on the US is marginal. US and European data is encouraging. More importantly, inflation poses no threat right now and this is usually how the US experiences a recession, when the Fed tries to induce a soft landing and causes a recession in the process. This isn’t of concern. So we can continue to ask which of this sample of banks will increase the most in value and think in terms of ongoing growth to frame this discussion. The 2018 EPS growth for BAC is based on its strong buyback programme and its gains in operating leverage, with consensus now convinced of its ability to hit its 2018 $53bn core cost target. The same factors underpin the outlook for 2019 as well, by the way. OK, there’s a bit left for 2019, if we are to insist that BAC should trade at the same forward consensus PEs as the more richly valued peers in the table. But the difference is now down to mid-single digits so it starting to look like a margin of error to me. Still, BAC should produce better EPS growth than these peers and probably has a little re-rating left. Where I think Buffett may get a lot of juice in 2018 is from Wells Fargo (WFC). 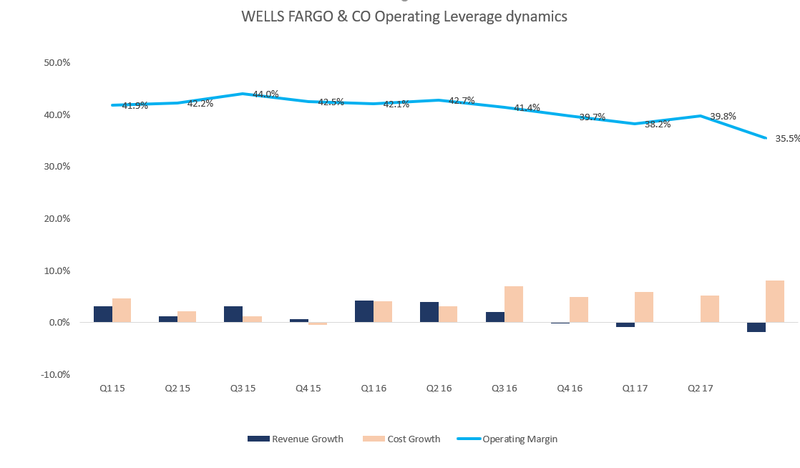 WFC has had a forgettable year so far with its reputational recovery ongoing and upward pressure on its efficiency ratio leading to some lacklustre numbers while many in its peer group have been posting markedly improved operating leverage and enhancing fairly stodgy top line growth in this way. But, so what, you ask? WFC has the lowest growth of the bunch on a two year view. It’s on the same PE as JPM out in 2019 if consensus is right, where’s my alpha if I own it here? The alpha should come from WFC’s re-rating as it gets its mojo back in terms of efficiency improvements and its customer care program wins more believers as it beds down. This is because WFC is probably worth a higher PE than the other large banks in that sample above. To see why, consider WFC’s income structure in the chart below. There’s been a recent step down in non-interest income which is essentially a one off shift in mortgage banking fee income, which I’ve highlighted. 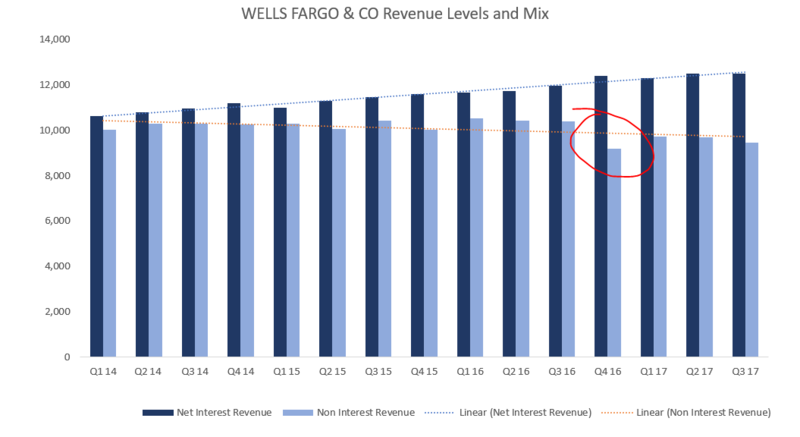 WFC has been re-engineering its software and branch network in 2017 and this has led to costs growing ahead of income, which has been beleaguered by the drop in mortgage banking fees I highlighted in the income chart for WFC and led to a lower operating margin. We see this below. The key point is that the cost growth should be finite, then the margin will pick up. WFC will see this cost growth slow in 2018, and its revenue growth rates should improve as base income effects roll off through 1H18 and a rate hike in December 2017 gives a further boost to net interest income, which is growing steadily anyway. This should allow WFC to regain a valuation premium over the likes of BAC. Stay with BAC for its EPS growth and remaining valuation catch up such as it is. Stay with WFC for its prospective PE rerating as it gradually overcomes its problems and benefits from front loaded costs going into 2018. Disclosure: I am/we are long WFC, C, BAC. CHICAGO (Reuters) – Black Friday and Thanksgiving online sales in the United States surged to record highs as shoppers bagged deep discounts and bought more on their mobile devices, heralding a promising start to the key holiday season, according to retail analytics firms. U.S. retailers raked in a record $7.9 billion in online sales on Black Friday and Thanksgiving, up 17.9 percent from a year ago, according to Adobe Analytics, which measures transactions at the largest 100 U.S. web retailers, on Saturday. Adobe said Cyber Monday is expected to drive $6.6 billion in internet sales, which would make it the largest U.S. online shopping day in history. In the run-up to the holiday weekend, traditional retailers invested heavily in improving their websites and bulking up delivery options, preempting a decline in visits to brick-and-mortar stores. Several chains tightened store inventories as well, to ward off any post-holiday liquidation that would weigh on profits. TVs, laptops, toys and gaming consoles – particularly the PlayStation 4 – were among the most heavily discounted and the biggest sellers, according to retail analysts and consultants. Commerce marketing firm Criteo said 40 percent of Black Friday online purchases were made on mobile phones, up from 29 percent last year. No brick-and-mortar sales data for Thanksgiving or Black Friday was immediately available, but Reuters reporters and industry analysts noted anecdotal signs of muted activity – fewer cars in mall parking lots, shoppers leaving stores without purchases in hand. Stores offered heavy discounts, creative gimmicks and free gifts to draw bargain hunters out of their homes, but some shoppers said they were just browsing the merchandise, reserving their cash for internet purchases. There was little evidence of the delirious shopper frenzy customary of Black Fridays from past years. However, retail research firm ShopperTrak said store traffic fell less than 1 percent on Black Friday, bucking industry predictions of a sharper decline. “There has been a significant amount of debate surrounding the shifting importance of brick-and-mortar retail,” Brian Field, ShopperTrak’s senior director of advisory services, said. The National Retail Federation (NRF), which had predicted strong holiday sales helped by rising consumer confidence, said on Friday that fair weather across much of the nation had also helped draw shoppers into stores. The NRF, whose overall industry sales data is closely watched each year, is scheduled to release Thanksgiving, Black Friday and Cyber Monday sales numbers on Tuesday. U.S. consumer confidence has been strengthening over this past year, due to a labor market that is churning out jobs, rising home prices and stock markets that are hovering at record highs. SAN FRANCISCO (Reuters) – The judge overseeing a lawsuit between Uber Technologies Inc [UBER.UL] and Alphabet Inc’s (GOOGL.O) Waymo self-driving car unit issued a series of orders this week, prompted by information shared with him by the U.S. Department of Justice. U.S. District Judge William Alsup in San Francisco disclosed on Wednesday that he had received a letter from Justice Department attorneys about the case, which is set for trial in December. The judge did not reveal the letter’s contents. However, Alsup issued two subsequent orders, including one on Saturday, that discussed some details. He ordered Uber to make three witnesses, including a former Uber security analyst and a company attorney, available to testify on Tuesday at a final pretrial hearing. Trial is scheduled to begin on Dec. 4. It is unusual for the Justice Department to share information with a judge days before a civil case is set to begin. Earlier this year Alsup, who is hearing the civil action brought by Waymo, asked federal prosecutors to investigate whether criminal theft of trade secrets had occurred. That probe is being handled by the intellectual property unit of the Northern California U.S. Attorney’s office, sources familiar with the situation said. No charges have been filed. Representatives for Waymo, Uber and the Justice Department declined to comment. The former Uber security analyst could not be reached for comment. Waymo sued Uber in February, claiming that former Waymo executive Anthony Levandowski downloaded more than 14,000 confidential files before leaving to set up a self-driving truck company, called Otto, which Uber acquired soon after. Uber denied using any of Waymo’s trade secrets. Levandowski has declined to answer questions about the allegations, citing constitutional protections against self-incrimination. Since the case began, Uber said its personnel have spent thousands of hours scouring its servers and other communications devices but have not found Waymo trade secrets. In an order on Friday, Alsup referred to a former Uber security analyst in connection with the letter from the U.S. Attorney’s office and to certain “devices” the former employee said were maintained by Uber. Alsup asked Uber to disclose whether it had searched those devices for relevant evidence in the case. Reuters is part of a media coalition seeking to maintain public access to the trial. This is a follow-up to my October 24 article about General Electric (GE). My basic decision stated in that article was that I like the initial comments and actions by new CEO John Flannery, and I’m not inclined to close the GE position. However, I would view GE as CAFD (cash available for deployment) if an unusual opportunity came along and I didn’t want to use existing cash for the purchase. I decided to take no action until the November 13 GE Investor Update. I’ll provide more details about my portfolio action at the end of the article. Flannery is in charge. 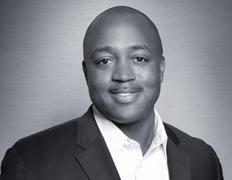 He has charted a new direction for the company, has built his own leadership team, and is re-shaping the Board. Miller is making a significant contribution. 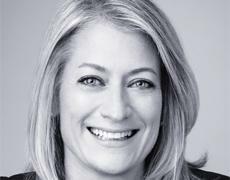 New chief financial officer, Jamie Miller, will be a key part of GE’s turnaround story. Joyce leads “GE at its best.” Vice Chairman David Joyce since 2008 has been the CEO of GE Aviation, the company’s most profitable division. Stokes is the one to watch. Russell Stokes, the CEO of GE Power, has the tough job of turning around GE’s largest and most challenged division. 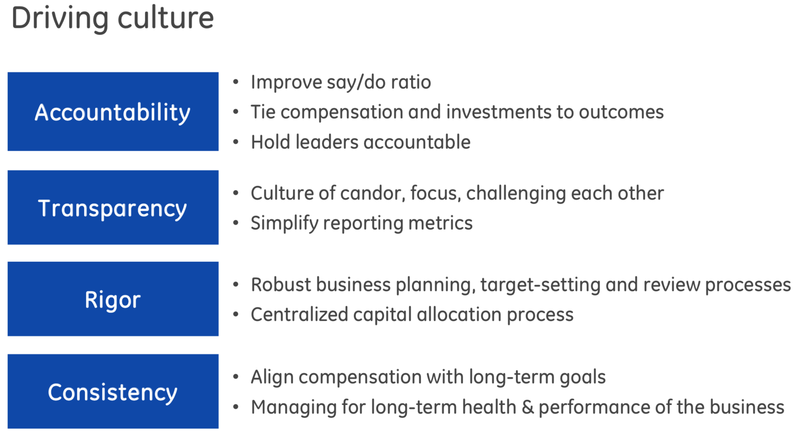 “Complexity hurts us.” Flannery is designing a simpler and more focused GE, putting priority on units with cash flows that grow the bottom line. Collaborative, competitive rigor. Flannery expects pushback and thrives in fluid situations where options are open-ended and vigorously debated. Growing cash flow, operating earnings, and dividends. 2018 will be the base from which growth will be measured. Flannery expects growth. On November 15, Flannery purchased 60,000 GE shares at $18.27, or $1.096 million. In August, shortly after becoming CEO, Flannery bought 104,000 shares at $25.56 per share, or $2.7 million worth of GE shares, bringing his total at that time to 615,000 shares, worth (at that time) $15.6 million. He also owns 101,000 restricted stock units and options to purchase 2.6 million shares at a $11.95-38.75 price range (SA Aug. 10). So, since becoming CEO, Flannery has purchased 164,000 GE shares at an average cost of $23.15 for an investment of $3,796,000. GE shares closed at $18.21 on November 17, so the 164,000 shares recently purchased are now worth $2,986,440. Flannery has a paper loss of $809,560, or 21.3% on those two purchases. This brings his total stake (not counting restricted stock units and options) to 675,000 shares, worth $12,291,750 as of November 17. Quotations below are from the November 13 Investor Update held in Atlanta, Georgia. You can access a replay of the webcast at the GE website, and you can also access an edited version of the transcript from the GE website. Former CEO was widely disparaged, and some GE shareholders hoped for a clear break with the Immelt years. As CEO of GE Healthcare, John Flannery was viewed by some as an “accomplice” who bears some responsibility for GE’s recent past. Although Flannery has been at GE for three decades, he is not a “me, too” person. He thinks for himself and he has moved thoughtfully yet quickly to implement strategic change. I consider him an “insider’s outsider.” He has demonstrated the ability to view familiar territory objectively and analytically. He knows how to “orbit the giant hairball” without becoming entangled in it. He is an insider who is leading from the outside. Flannery, GE’s new CEO, previously was CEO of GE Healthcare. 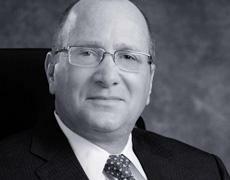 Jamie Miller, the new CFO, previously was CEO of GE Transportation. 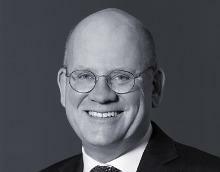 Russell Stokes, the new CEO of GE’s most challenged division, GE Power, was previously CEO of GE Energy and he is tasked with merging GE Energy with GE Power. The announcement of Stokes’ appointment came two days after the announcement that Flannery would be the new GE CEO. David Joyce, the CEO of GE’s most successful division, GE Aviation, has been in that role since 2008 and he serves as GE’s Vice Chairman. The common thread is that each of these key leaders has had experience running a GE division. Senior Vice President and Chief Financial Officer Jamie S. Miller was prominent in the Investor Update presentations. She fielded questions along with CEO Flannery. She is new to the CFO position, moving a few weeks ago from her role as President and CEO of GE Transportation. I like the new management’s transparency. There’s been a consistency of content and style in Flannery’s public interviews, the 2017 Q3 earnings call and the Investor Update. I’m convinced his message is the same to the public and to individuals inside and outside the company. I plan to continue to hold shares of GE. I’m more impressed with CEO John Flannery after the Investor Update. He has articulated a clear set of values and priorities. He seems to thrive on fluidity and the challenge of a changing landscape. He announced a plan to raise $20 billion in divestitures. Some people might have expected that he would produce a list of assets to be sold, with an approximate price tag on each. But Flannery is approaching this $20 billion target in a pragmatic and (I believe) appropriate way. 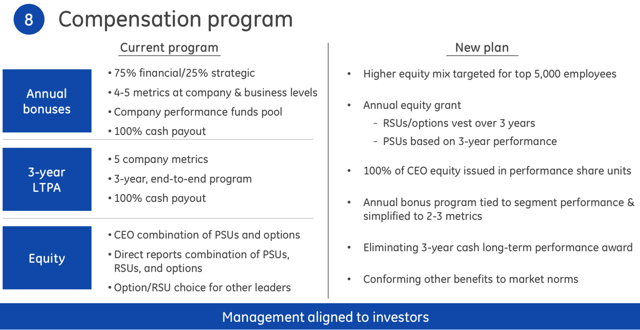 The company is continuing to manage and grow each of the segments to maximize profitability as it explores options for how to maximize shareholder value. This is a good example of how Flannery charts a course (i.e., “we intend to sell GE Transportation”), but the “when” and “how” of that decision will depend on how well the division executes and how macro market forces unfold. I have a brokerage account and an IRA. I’ve had some holdings in both accounts. For simplicity, I’m eliminating duplications. I was holding 80% of my GE shares in the IRA and 20% in the brokerage account. I decided to sell the GE shares in the brokerage account (where I’ll realize a tax loss by selling at $18.27). I applied the proceeds toward the purchase of some shares of Magellan Midstream Partners (MMP) at $65.00. It makes more sense to hold MMP in the brokerage account. The sale of 20% of my GE shares reduced the allocation from 1.96% of the portfolio to 1.61%. I feel better with this somewhat lower allocation for GE. I agree with John Flannery that this is “show me” time. If I continue to view GE’s new management favorably and if the turnaround materializes, I would be willing to add more GE shares. One factor I’m watching is whether Standard & Poor’s maintains its AA- credit rating on GE. S&P has placed GE on negative watch for a possible downgrade. I expect GE shares to trade in a range of roughly $15.00 to $20.00 over the next 12-14 months. The stock’s price dropped to $5.87 on March 4, 2009, in the depth of the Great Recession’s bear market. The 2010 price range was $13.75 to $19.69. I could see the price of GE stock approximating the 2010 range in 2018. During 2010, GE paid $.46 per share in dividends, which approximates the current $.48. I think GE will hold at the $15 level, although a severe market downturn could knock GE shares down to the 2010 lows. We’ll have a clearer picture after the 2018 results are reported about 14 months from now. My target price to consider adding more GE shares is $16.67, which would equal a dividend yield of 2.88%. I might lower the target if S&P lowers GE’s credit rating. My goal is to write at least one article a week, usually about a company in my retirement portfolio. I’ve been writing recently about REITs in the portfolio. That will continue for the next few weeks, but I wanted to provide this update about GE. I always learn from our Seeking Alpha conversations. I welcome your opinion because your responses enrich our discussion. What’s your take on GE’s new management and the company’s prospects? You can access a list of previous articles here. It’s not my intent to advocate the purchase or sale of any security. I offer articles to provide ideas for stocks to study and to share a journal of my effort to design and build a retirement portfolio that puts a priority on relative safety, a history of dividend growth and solid future prospects. Your goals and risk tolerance may differ, so please do your own due diligence. Disclosure: I am/we are long GE, JNJ, PG, MMM, WMT, MSFT, MRK, PFE, XOM, AAPL, CSCO, TD, SPG, ADP, RY, BCE, O, VTR, DUK, KMB, PPL, SKT, PEP, NNN, WPC, GPC, EPD, MMP, BEP, BIP, TGT, SO, IBM, TXN, VFC, QCOM, KO, HRL, UL, PEGI, MRCC, HASI, APLE, BIF, VTI, VEA, VWO, VYM, VOE, VNQ, VPU. (BRUSSELS) – European Union privacy regulators will discuss ride-hailing app Uber‘s massive data breach cover-up next week and could create a task-force to coordinate investigations. Uber faces regulatory scrutiny after CEO Dara Khosrowshahi said the company covered up a data breach last year that exposed personal data from around 57 million accounts. The chair of the group of European data protection authorities – known as the Article 29 Working Party – said on Thursday the data breach would be discussed at its meeting on Nov. 28 and 29. While EU data protection authorities cannot impose joint sanctions, they can set up task-forces to coordinate national investigations. When a new EU data protection law comes into force next May, regulators will have the power to impose much higher fines – up to 4 percent of global turnover – and coordinate more closely. Uber paid hackers $100,000 to keep secret the massive breach. The stolen information included names, email addresses and mobile phone numbers of Uber users around the world, and the names and license numbers of 600,000 U.S. drivers, Khosrowshahi said. Uber declined to say what other countries may be affected. “We cannot but voice our strong concern for the breach suffered by Uber, which was reported belatedly by the U.S. company. We initiated our inquiries and are gathering all the information that can help us assess the scope of the data breach and take the appropriate steps to protect any Italian citizens involved,” said Antonello Soro, President of the Italian Data Protection Authority on Wednesday. The British data protection authority also said the concealment of the breach raised “huge concerns” about Uber‘s data policies and ethics. Long known for its combative stance with local taxi regulators, Uber has faced a stream of top-level executive departures over issues from sexual harassment to data privacy to driver working conditions, which led its board to remove Travis Kalanick as CEO in June.